AVAST! Thar be pirates operatin in these here waters!!! Here ye will find every jeweled facet of information pertaining to the Annual Pirate Treasure Hunt held in Depoe Bay Oregon. Although it is FUN, this is a charity event. ALL proceeds are donated to local charities. Join us, and yer fellow Pirate Brethren for a fun filled day of adventure and mystery upon the high seas! The Pirate Treasure Hunt takes ye in and around the streets and attractions of Depoe Bay, noted as the worlds smallest harbor. But don't let size fool ye, swabby. This hunt will have ye wishin fer a pleasant sail on a calm sea. Ye and yer crew of 3 (that be 4 total ya know) must complete challenges and tasks in the first half o' the day that will help ye gather needed items and information. There's nothin too terribly physical or dangerous, just fun challenges and activities that may or may not be piratically inspired. A story / mystery unfolds on the streets in the second half o' the day. Yer crew must decipher the story and play out the intricate challenges that will enable ye to sail to victory and take on some great booty. Hold on to yer eye patch fer this action. You'll be needin both eyes, Matey! Yer piratical engagement continues into the afternoon with a silent and live auction, and simultaneous cavorting about by some of our regular crew, plus a few scallywags and ne'r-do-wells that seem to drift this way. The booty prize awards for winning teams placement also conclude the event. Every team will receive a special treasure chest loaded with booty, with values starting at $25.00 and going up to hundreds! Then, join us and yer fellow pirates for social interaction with other pirates and the locals (raising swords, and wild skullduggery!) The local watering holes / restaurants are always ready to receive pirates from these here waters. From a quiet back table in a nice eatery with your pirate family, to a raucous gathering of crazy pirates in a bar complete with special drinks and piratitude a plenty, join us for the camaraderie! The rough idea of a TIMELINE............ Keep yer head about ye, Mate. These be pirates, after all! Time and hard intineraries are NOT some o' their better traits! Yer team should already be attired in your piratical garb when ye arrive! It starts the day o' fun off right! Registration for the Treasure Hunt is usually 8:00 to 9:30am at Pirate Coffee Company (north end of town). Your team captain will receive the all important rules and needed documents. Then, team and group photos are taken (promptly) at 9:45 at the Whale Park (north end of town), followed by the hunt's storyline reading and cannon fire signaling the start of the hunt (10am or thereabouts). After the team tasks in the morning, a short break, and the afternoon story-in-the-streets, teams will conclude the hunt about 3pm, some maybe earlier. The ever popular silent and live auctions will follow with light social snacks and non alcoholic refreshments and strolling entertainment. Our auctions are known for some amazing deals. We've seen items go for a fraction of their value! Of course, the awarding of the booty filled treasure chests will conclude the day. Sign up early. Make yer plans, and shanghai a crew! Don yer pirate attire and muster up some piratitude! New teams are always a welcome part of our event. And, we'll welcome back teams that have enjoyed hunts for the past 13 years! All pirates, young and old, be welcome here. Ye don't have to be a team or participate in the hunt to enjoy the day as a pirate (though you'll wish you did). 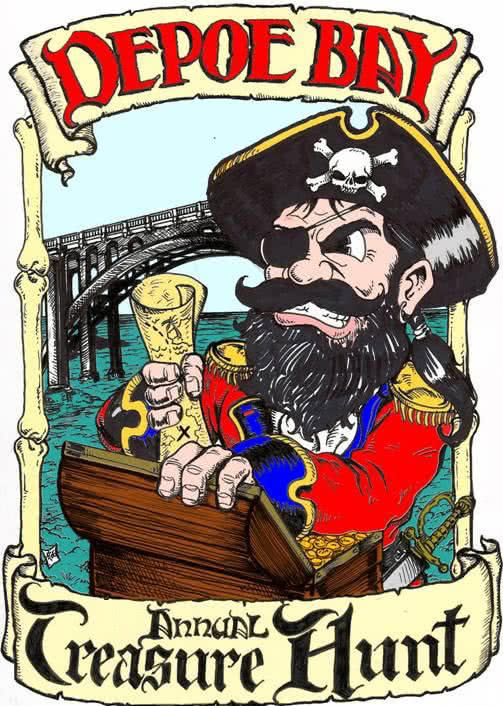 We enjoy pirates and their tales on the streets of Depoe Bay anytime! We'll even have tasks and challenges (FUN) for the wee pirates (KIDS). Come join the fun on the beautiful Central Oregon Coast! © 2019 Bayside Chapel Depoe Bay | Built by Zenith Exhibits,Inc.